But wait. Don’t go. You don’t have to like recipes or fashion design to love Pinterest. Other kinds of people exist on the social network too. If you look closely, you can find Pinterest users who are interested in photography and search engine optimization. Some are passionate about writing. Others prefer American History or the macabre. You just have to look deeper. Users on Pinterest gather images and videos they find interesting, funny or thought-provoking and pin them to their page. Others can comment on them, like them or repin them to their own Pinterest pages. But one of the best features of Pinterest is that it allows you to take all the images and videos you’ve collected and organize them into boards. Why is this so important? Because you don’t have to follow everything that someone else pins. You can be picky and choose only the boards that interest you. What? You’ve already made the mistake of following all of your best friends’ pins? Don’t worry. You can actually unfollow them and then follow specific boards on their pages instead. (Look for the “follow” button located under the board you like. Click on that “follow” button instead.) Or if one specific board annoys you, you can unfollow that one board. Go ahead. Do it at midnight when no one is watching. If you’re browsing your Pinterest stream (the page showing all the images and videos pinned by those you follow), you may be fascinated by an image for a moment. You can show your appreciation for that “pin” by clicking the “like” button or you can even comment on it. If that image really holds your interest and you think it helps define you, you can repin it onto one of your boards. Repinning gives credit to the person who first pinned the image. Consider posting images onto your website or your blog FIRST, then pin to one of your boards. This is an opportunity to attract people back to your website. When searching for images on the web, try not to pin images from Google. Instead, look for the original source, if you can, so that person gets credit for creating such a great image. When searching for images on Pinterest, don’t forget that you can search “Pins” or “Boards” or “People.” Try all three. To become a member on Pinterest, you have to be invited. You can request an invitation on the home page, but it may take a few days to receive a welcome e-mail from Pinterest allowing you to set up your account. But once you’re in, it is easy to learn. Pinterest is very intuitive. You will be comfortable with it in no time. Check out their Pinterest Help Page. 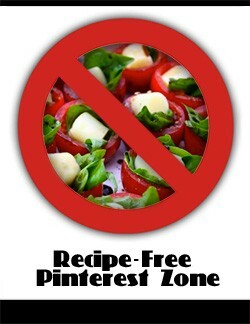 And feel free to join the Recipe-Free Pinterest Zone. You can do it quietly by choosing not to follow any “I LOVE RECIPES” boards. But if you suddenly have a craving for caprese salad appetizers, you may be out of luck.